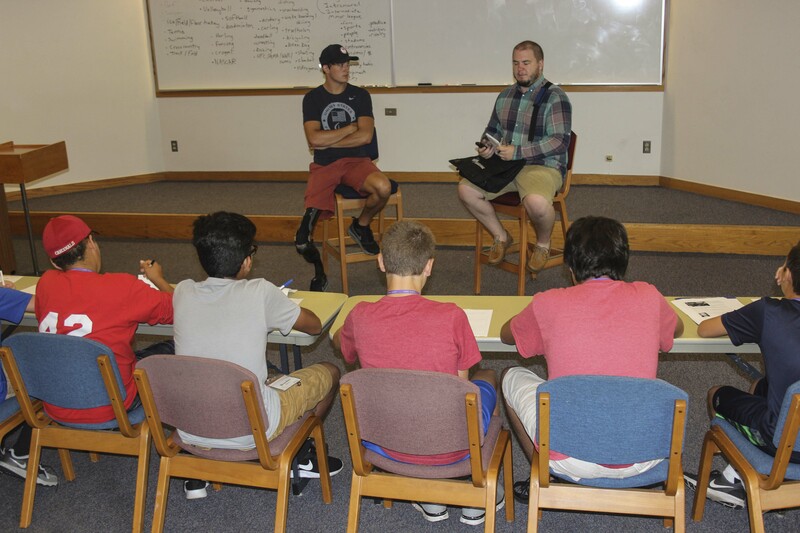 Sam Grewe and Stephen Brooks joined Goshen Write on Sports on Tuesday, July 11. Sam Grewe, a 19-year-old from Middlebury who won a gold medal in the high jump in his World ParaAthletics Championships debut in Qatar in 2015, is hoping to claim the high jump record when he competes against the best athletes in the world again this month in London. 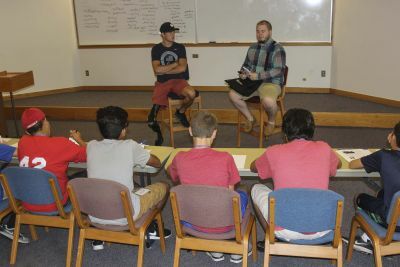 Grewe visited the Goshen Write on Sports camp on Tuesday along with Stephen Brooks, sports editor for The Goshen News. Early on, Brooks told the young student journalists that they have to be patient and flexible during an interview and “let the story reveal itself.” It was sound advice. As Grewe fielded questions from Brooks and the campers, he provided multiple leads for stories. Grewe, who lost his right leg to cancer in 2012, is leaving on Sunday for the World ParaAthletics Championship in London. He’ll compete on the last day of the two-week competition. In 2015, he jumped 1.81 meters, or about 5.94 feet, in Qatar. In 2016, he jumped 1.86 meters, or 6.1 feet, to win a silver medal at the Paralympics in Rio. He missed the gold by 2 centimeters. Since then, he has jumped 1.93 meters, or 6.3 feet. The world record is 1.96 meters. Sam Grewe and Stephen Brooks, the first guests of the 2017 camp. 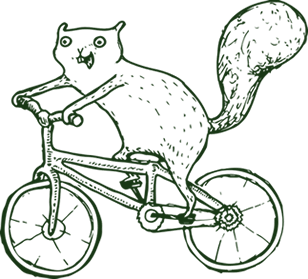 In the final preparations, Grewe is on a strict diet, aiming to have the leanest possible body to slip over the bar. “One of the hardest things is giving up meat,” he said. Grewe’s father, as it happens, is the owner of Old Hoosier Meats in Middlebury. One of the surprise benefits of being an athlete who represents the U.S. is the gear, he said. Before leaving for the Paralympics in Rio, team members gathered in Houston. Sponsors of Team USA provided athletes with dozens of shirts and something on the order of 80 pair of socks and 10 pair of shoes, he said. Brooks told the students that Grewe provided an excellent interview in part because he supplied details and vivid images. For example, when he recounted the history of his cancer, he said surgeons found “a fist-sized tumor.” And when competing in Qatar, Grewe said that he took the field around midnight and “it was still 115 degrees with 60 percent humidity.” He said he drank six water bottles during competition. “It was ridiculously hot,” he said. In the fall, Grewe will attend the University of Notre Dame, where he plans to continue high jumping and major in pre-medicine.